Marianas Variety just published an article on Obama’s upcoming visit to Guam. The fact that the US President has decided to fly 9000 miles to visit the Marianas is HUGE news… and speaks to how vital these tiny islands are to America’s global strategy. 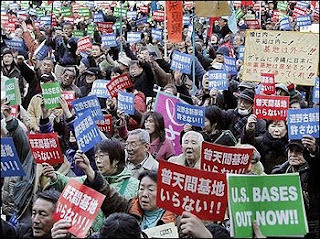 On the same day, the Associate Press reported this story about thousands of protestors in Tokyo (not Okinawa – Tokyo), asking the US military to GO HOME. Something tells me these two things are related. The real question now is: how do we get Obama to watch The Insular Empire? I’ve read Obama’s book Dreams From My Father, and I really believe that Obama understands, first-hand, what it means to be colonized. I’d like to believe that if he understood the Marianas’ colonial history, he’d start doing something to help the people of Guam – and the Northern Marianaas – achieve true self-determination.